The 17 Mile Drive is a scenic drive in the Monterey area. You enter through the gate in Pacific Grove and pay a per car fee. The drive is well marked and provides many photo ops. The drive takes you by the famous Pebble Beach golf course and by some impressive mansions. One of the spots of interest is the "Lone Cypress" (pictured above), the official symbol of Pebble Creek. Cannery Row is the locale made famous by John Steinbeck's novel of the same name. Today it is a bustling tourist strip in Monterey anchored at one end by the Monterey Bay Aquarium. Cannery Row is home to a variety of shops, hotels, and restaurants. 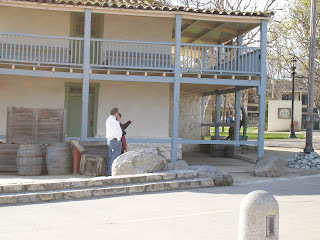 It is also home to the Spirit of Monterey Wax Museum, a dusty exhibit documenting the history of Monterey from the Spanish settlers up to the time of John Steinbeck. This definitely qualifies as one of the cheesiest exhibits I've ever seen. It takes less than half an hour to see and might be worth it if you have nothing else to do, otherwise I would skip it. 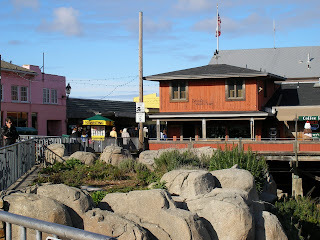 Other activities on Cannery Row involve, shopping and eating. I definitely recommend a visit to the Fish Hopper, a restaurant with both great food and good service. Old Fisherman's Wharf in Monterey is one of the main tourist areas in Monterey. It is full of the ubiquitous t-shirt shops, as well as populated by numerous restaurants. This is the place to go for an on-the-water tour of Monterey. Cabo's Wild Mexican Seafood* is the place to go on the wharf for breakfast as none of the other wharf restaurants open that early. Of course, most of the restaurants are seafood themed and this is definitely a great place to be eating seafood. Adjacent to Fisherman's Wharf is the Monterey Maritime Museum and the Custom House (pictured above). The Custom House is part of the California State Parks system. *UPDATE: It seems that Cabo's is now called "The Breakfast Spot" according to the sign out front on my recent trip to Monterey. So, you can still get breakfast there, but maybe not the Mexican food they has before as they had a sign outside that said "Fish and Chips" among other things...not a very Mexican dish.